This is a photograph of Charles A. Richard and Lula Jerusha Richard. She was the daughter of Joseph and Sarah Ford and they settled in Nemaha County, Kansas. 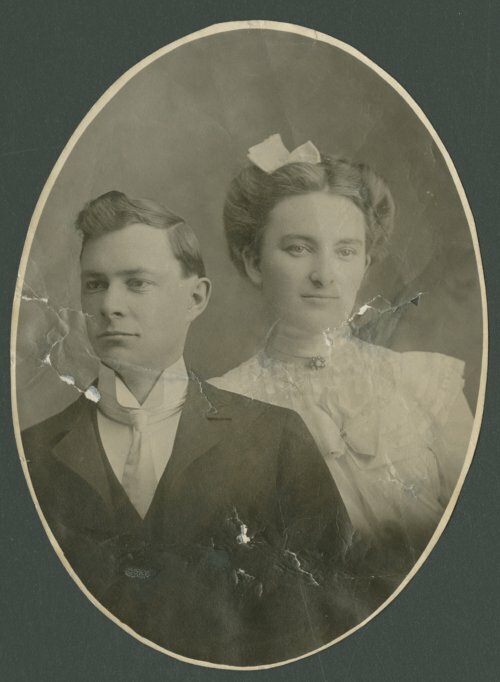 Charles and Lula were married September 14, 1902, and they had four sons: Glen U. (born May 9, 1905), Quentin L. (born June 25, 1907), Wilbur O. (born December 19, 1910), and Charles A, Jr. (born May 14, 1916). Charles A. Richard was a minister and lecturer in Seneca, Nemaha County, Kansas. Later, he was a minister at the First Christian Church in Lawrence, Kansas. Also, he was a Republican and served in the Kansas State Senate in 1937, SS1938, and 1939 representing District 17.